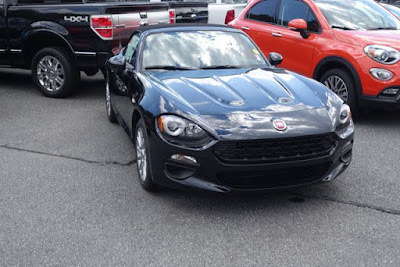 Here’s a word to the wise: don’t show up at an Alfa/Fiat dealership and ask to test drive the new Fiat 124 if you have absolutely no intention of buying it. I say that because that is exactly what I did today and the car salesman who was demonstrably French and uninterested in American schmoozing, was not budging. If he gets his way, there will be no test driving of the 124 today. He got his way. He later added that what applied to the Fiat absolutely applied to the Alfa 4C, of which they had two in their showroom. 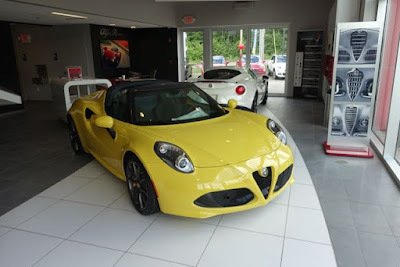 To properly emphasize his point, he said one potential customer had to deposit $30,000 before he could drive the Alfa out of the lot. 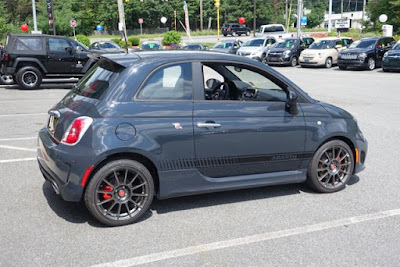 So, with my dreams of the latest Fiat thwarted, I cleared my throat and asked if I could take out an Abarth with a manual transmission. 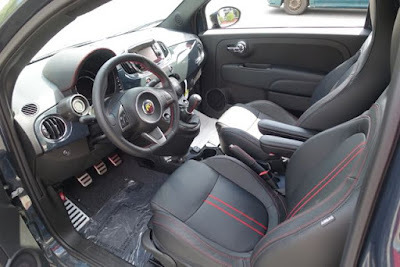 The Fiat Abarth has been around for few years now and is the sportier version of the Fiat 500. 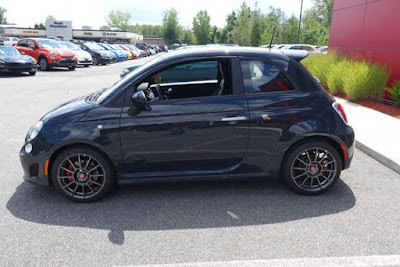 My confident tone came from the fact that I might actually buy an Abarth and I could tell that the Frenchman could tell that. He hemmed a bit as the French always do but eventually went to get the key. I’m glad he did because I’m genuinely glad I had the chance to drive it. 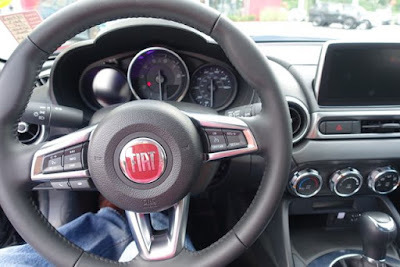 Although I only drove one of the two cars, here’s a brief review of both. First, the 124. As car people know, the new Fiat 124 is made in conjunction with Mazda and presents an Italian alternative to the two-seater roadster, a segment that Mazda has dominated for the last 25 years with its Miata. Many are commenting that this recent Italian-Japanese partnership producing the 124 is a good idea all around: Japanese reliability and decades of experience, Italian flare and styling. It bears noting that on the Fiat side, the 124 is a reprint of a car they made for decades starting in the mid-1960s, so it’s a car that comes with a pedigree. I may yet find a way to drive this car, but since today was not that day, my review will be short-lived. The cockpit is enjoyable enough though I’m told the layout is very similar to the Miata. The one thing I can comment on because I noticed almost immediately - the seat was not very comfortable. I think I’m being fair by saying that I am neither a slender man (those days have long since departed), nor am I an outrageously fat man, so a seat that feels too narrow is a seat worth noting. Beyond that, pedal feel is hard to gauge from a car that isn’t moving, so I'll have nothing to add there. The car does look good, and I don’t doubt that it drives well too. Next time, I’ll either have to bring my checkbook, or do a better job of faking it. Now, on to the Abarth, a car that I could potentially buy and actually like quite a lot. 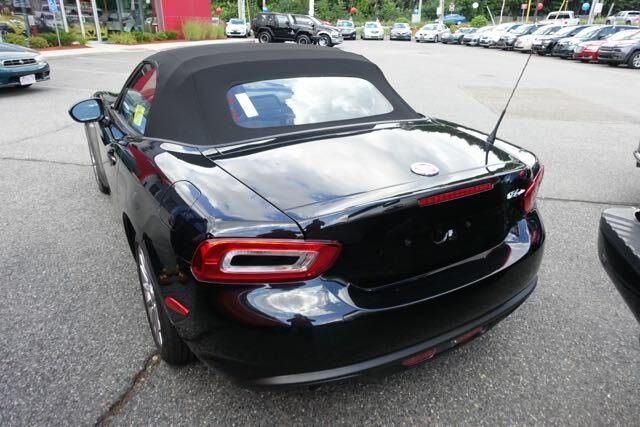 Quick and sporty with ample room in the cabin and a wonderful exhaust note, this is an exciting car. It handles well, is front-wheel drive and turbocharged but does not get great gas mileage. It also has very little in the way of storage space and it is a two door. In other words, don’t plan any long hauls with this car. It won’t be very friendly to those. In the end, it’s hard to sum up the Abarth. It’s an attractive, sporty fun machine made for driving quickly and with pleasure. 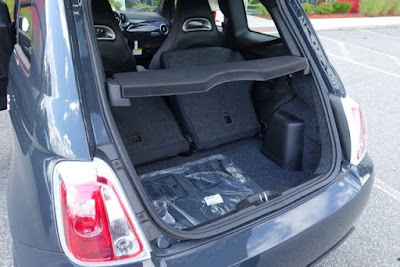 It is perhaps exceptionally handy as an around-town urban car, but for the bigger jobs, it seems as though it would cause more frustrations than it would relieve. As for my car buying plans, these two Fiats notwithstanding, nothing yet has knocked the Chevy Volt from the top spot on my list. It's a car with its own set of flaws but has that electric-gas power plant that I find very attractive. The only real rival there is the Tesla Model 3, but that’s years away. I'm open to suggestions though.